Ryan LeBlanc, 19, of Manchester, NH lost control of his vehicle around 12:20 a.m. Friday morning and crashed into the home at 256 Boynton Street. 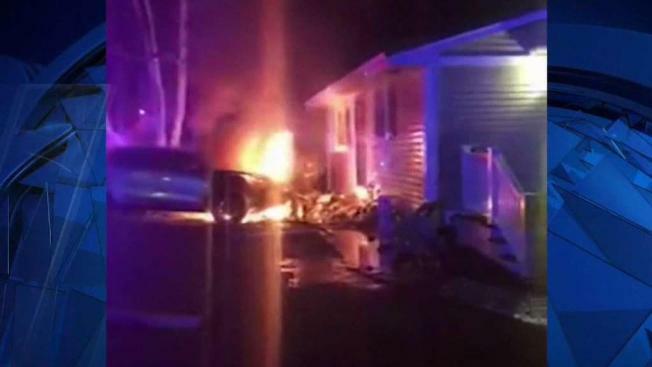 A man was arrested and charged with OUI after he lost control of his vehicle Friday morning and struck a Manchester, New Hampshire home, according to police. Ryan LeBlanc, 19, of Manchester lost control of his vehicle around 12:20 a.m. Friday morning and police were called to 256 Boynton Street for a single vehicle crash. The 2018 Kia caught fire after it struck the side of the residential home. The crash severely damaged the vehicle, which was towed from the scene. The crash also damaged the house's foundation and stairs. According to police, the driver was arrested without incident and medically cleared after he was seen at an area hospital. The officers on scene determined LeBlanc was intoxicated and he was charged with aggravated operating under the influence of liquor. LeBlanc was released on $1,000 bail and is scheduled to appear in the 9th Circuit Court-Manchester on May 11.